Bernie Goldbach in LSAD-Clonmel | Screenshot from my Dropbox. DROPBOX HAS BECOME a clever social sharing service and I like its new preview features. It's always nice to see a preview of an image but now Dropbox has added the ability to preview documents. It will take a few months for the Dropbox universe to be able to double-click on a PDF, DOC, DOCX, or PPT file and see a preview of the file before you download it. What is just as intriguing for me is the new Dropbox "Camera" section. By clicking "Camera" in the left sidebar of the web view you will see an interface that I have on the Xoom Media Tablet. In that view, all the photos uploaded from three different phones are grouped by date. This is a handy way for me to see what our five-year-old daughter is drawing because she snaps shots of her precious artwork every day. 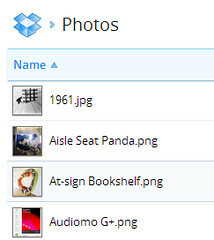 I can group the images into individual albums and share them via email, Facebook and Twitter directly from the interface. This is sophisticated sharing because content in albums remain intact even when individual photos move to different folders in my Dropbox. Bernie Goldbach in Ireland | Photo of Stephanie Lower in Maryland. I KEEP A JOURNAL that spans various sorts of media, including some old cassette tapes that I'm digitising. I stumbled upon one from Stephanie Lower on the anniversary of her death. For 2013, I'm trying to finish each week with a "Found" item and an old tape--this one from June 1990-- complete with pops and hisses, qualifies as a major find. It also comes with all the artefacts of the cassette era as listeners will discover in the audio clip below. I shared the audio clip to the Audioboo community and immediately connected with audio engineers who offered very helpful suggestions about how to eliminate the irritating hum accompanying Stephanie's voice at various intervals. Bernie Goldbach is trying to figure out a way to produce a multimedia journal before producing the ebook. Bernie Goldbach in LSAD-Clonmel | Screenshot of Interesting People on my Audioboo Dashboard. ALONG WITH AT LEAST 50 other people, I am attempting to record short audio clips aboard common topics of interest during the month of February. The initiative is being hashtagged as #Febooary on several social networks. I skimmed through the past 12 months of content inside the "audio" folder on my removable drive and made an eight minute clip for Audioboo.fm. It's also part of this blog post and I hope it informs the judgment of several creative multimedia students who may also dive into the free-flowing conversation. Bernie Goldbach is topgold on Audioboo. The article sites a report from TDG Research, 'A Primary Profile of Cord Cutters and Cord Nevers', that found today, 87% of broadband households currently subscribe to a pay-TV service, a decline of almost five percentage points since 2010 but nonetheless a very strong indicator of the grip that pay-TV has an US households. That being said, a growing number of broadband subscribers are now doing without pay-TV services altogether, having either “cut the cord” or never signed up to begin with in the first place. 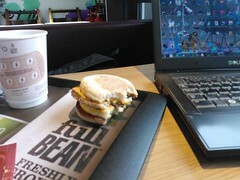 Bernie Goldbach in Cashel | Laptop snapped at our local McDs. I SEE A LOT of road warriors encamped at our local McDonald's with laptops and tablets. They're using free and open wifi under the Golden Arches. McDonald's in Cashel is the only place you can sit and surf after 10PM in town. The local library's free wifi closes much earlier than that. If you live in a rural area within 10 miles of our local McDonald's in Cashel, County Tipperary, you should be able to see high-speed internet services over-the-air. However, if you cannot afford twenty or thirty euros a month for a mobile data contract, McDonald's is free for the surfing. I've seen school students in their uniforms finishing up Happy Meals before spending an hour online in their seats while completing school assignments. The local McDonald's signal reaches outside to picnic tables and upstairs in the Topaz next door there's a very strong free wifi option as well. I have never seen staff requiring people seated with laptops to purchase meals or beverages. That said, it's hard to sit and watch someone eat without salivating yourself. Bernie Goldbach in LIT-Clonmel | Photo from G+. 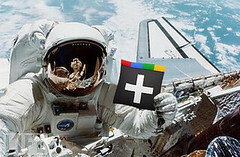 I JUST DON'T UNDERSTAND why Google+ gets dismissed as a place for meaningful online activity. Just looking at brands, I see there are 30 brands above the million follower mark on G+ compared to 33 on Twitter. There are real social followers in both places--and that's the point--provided the brands offer something interesting (or they dump a load of money into advertising). I listen to dismissive attitudes about Google Plus in Ireland and think it's really down to people preferring to hang out in familiar settings with friends. During my six years on Twitter, I've followed and later met up with really interesting people. The same is happening for me inside Google Plus. Bernie Goldbach in Cashel | Photo of reliable E90. BECAUSE I CRASHED my Lumia 800 so hard that nothing would reset it, I pulled my Nokia E90 out of its drawer for my main phone. Amazingly, it started up right away before demanding a recharge. I had forgotten what it was like to go three days between recharging a handset. If I don't use the phone to talk and if I run my email only occasionally, I easily get 24 hours between recharging the handset. But that battery savings comes at a cost--this is a rock-solid Symbian S60 phone without all the apps I regularly use on my handsets. I miss flicking through the Lumia's People Hub. I miss getting snappy newsfeeds. I miss easy, dependable calendar synching with Google Calendar. But I remember ploughing through a lot of productive days with the Nokia E90 several years ago and I believe the phone's limited usefulness with Twitter and Facebook is actually freeing up a whole hour of time throughout a normal day. That's a telling lesson in productivity and suggests I will make big gains in my output if I confine my social grazing to occasional forays with the Xoom tablet and iTouch instead of the always-on connectivity (and distraction) the Nokia Lumia afforded me. Bernie Goldbach is trying a rigorous GTD routine. 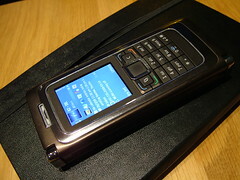 How great a deal is the £80 Nokia Lumia 610 on O2? Bernie Goldbach in LIT | One Desk Terabyte in the photo. I HAVE LEARNED a lot about back-ups and thanks to readers of my blog I keep getting even better ideas every year. My strategy involves using CrashPlan Pro to keep all my active files in the cloud by running a back-up service at night. I also push working notes, with files attached, into Evernote and academic course materials into Dropbox. I know I probably need an image of my Dell Precision M2400 laptop but that's missing from my strategy. I'm thinking about using an imaging tool like Acronis True Image although I might trust the System Image tool built into Windows. Acronic has additional options that look very sweet. I keep last year's external hard drive in a bottom desk drawer at work. I need to make its storage location fire-proof and I want to encrypt that drive for reasons related to intellectual property. Once I make the leap to seeding a disk image, I'll be back into the routine of practising a total restoration. Back-ups always work but total restores often hit snags. I know that if a natural disaster hits, all our best family photos are safe on Flickr and thousands of others are safe on CrashPlan or on an external terabyte. And that combination means I'm sleeping more soundly at night. Bernie Goldbach teaches modules on Business Office Management for the Limerick Institute of Technology. Bernie Goldbach in Cashel | Click image to get video. WHEN I LIVED in Germany, horse burgers sold briskly in Kaiserslautern's Saturday market. Horse burgers are in the Irish news for another week but largely because you shouldn't find horse meat in Irish burgers. I looked through a single Irish Sunday paper alongside the digital version of the Wall Street Journal as I created both an audio and video newsround. 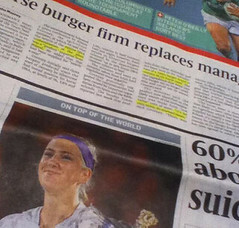 The Irish horse burger story has made the front pages of most Irish Sunday papers during the past two weeks but hasn't trickled over to the WSJ (as far as I have noticed). The issue is one of traceability with a hint of fabricated veterinary inspection stamps. Bernie Goldbach has a collection of newsrounds from Ireland. Bernie Goldbach in Limerick | Screenshot from Forbes. 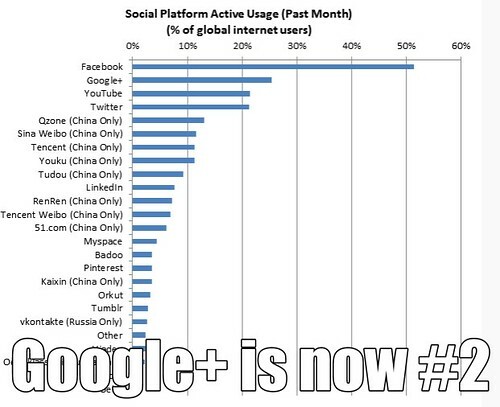 STATISTICIANS BELIEVE G+ is the second most-used social network on the planet. But drawing that conclusion is down to how you measure "use". I can only speak anecdotally when I watch scores of college students use Facebook's log-in features to access other parts of the internet. And I know the howls of disbelief that come from Facebook marketing experts who claim you cannot count the presence of the G+ numbering system in someone's Gmail as a use of Google Plus. And in the most authentic version of my real virtual life, none of my immediate family use G+ to share photos, check-ins, or Community discussions. And only a small blip of Irish Twitterspace has the time to swim in the waters of Google Plus. So "activity" is a relative term then. And the "activity" mentioned in this relatively obscure marketing analysis has not been cross-validated by notes provided to investment analysts by Google.